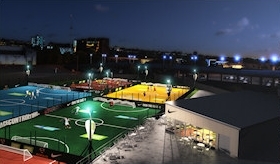 Small-sided football means 5 a side, 6 or 7 a side football but does not include mini-soccer, which is a game for under 10s played on a very small pitch. These are the base rules and regulations for playing small-sided football, however there may be slight differences between providers and leagues, particularly for disciplinary actions. The pitch must be rectangular. The length of the touchline must be greater than the length of the goal line. The pitch is surrounded by barriers. Spherical, made of leather or other suitable material and of a size appropriate to the age group playing (generally size 4 or 5). If the ball bursts or becomes defective: the match is stopped, the ball replaced and play recommences with a drop from where the first ball became defective. Eight players may be selected from the team squad for each match: five players and three substitutes. A match is played between two teams, consisting of a maximum of five players and a minimum of four, one of whom is the goalkeeper. · Shin guards must be worn. They should be covered entirely by the socks and be made of a suitable material that offers a reasonable degree of protection. A kick off is a way of starting or restarting play at the start of a match, after a goal has been scored, or at the start of the second half of the match. 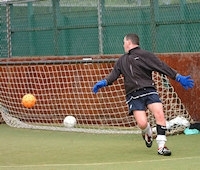 A goal may be scored direct from a kick-off. · The opponents of the team taking the kick-off are at least 1m from the ball until it is played. · The kicker may not touch the ball a second time until it has touched another player. The ball is still in play when it rebounds from a goal post, crossbar, roof, kickboards or referee. The ball is out of play when it has wholly crossed the goal line leaves the confines of the pitch. The ball must not travel above “head height”, defined as 6ft regardless of the height of the referee or any other player. If the ball rebounds from a crossbar, goalpost, kickboard or goalkeeper and travels above “head height” then play continues. Heading the ball is not permitted. If the ball travels above “head height” then the game will be restarted by the award of an indirect free kick to the opposing team from the point where the ball began to rise. When the ball is played into the corners of the pitch the defending player must allow the ball player to take the ball out unhindered, with five seconds to return the ball to play. A player may not stand closer than 1m from the ball when defending a free kick. The Penalty must be taken using the “one step” rule. · Retains possession of the ball for more than 6 seconds before returning it to play. · Receives the ball back directly from the same player he/she initially passed to, without it first touching at least one other player.